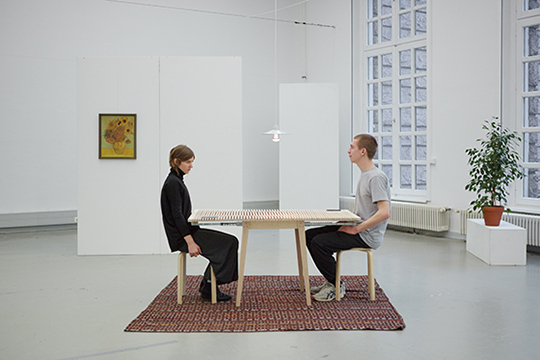 Inherent Reason is an installation consisting of a physical table and a web service. It evaluates the potential relationship of the users based on their social media appearance, and display it through a mechanical transformation of the tabletop. The user is logging in via Facebook connect while sitting at the table. The service is fetching photos from the user’s Facebook account via graph API. Using IBM Watson’s Visual Insight, the service is able to identify the content of photos and uses this to generate a profile. Both resulting personality profiles of the current users are getting matched against each other. 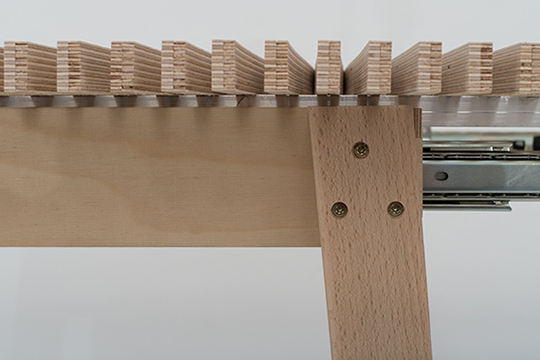 After the score is mapped into a distance, the desk varies its length with a gear system driven by stepper motors. Through the transformation the object dictates the interpersonal closeness and plays an active role in the interaction. With the rising of networked objects and the outsourcing of computational power, every article of daily use could behave in a complex way. The pervasive data structure and the usage of machine learning makes it possible to collect and interpret data without human supervision. Social relations can be mapped, interpreted, and therefore behaviour can be predicted. How does an object with agency formed by this cognitive computation behave and interfere? What happens to social interaction if relationships can be predicted and evaluated before they occur? Inherent Reason deals with the influence of cognitive computing in interpersonal relationships. It explores the effect of evaluating unstructured data sets and the possibility of autonomous decision-making based on these without human supervisory control. 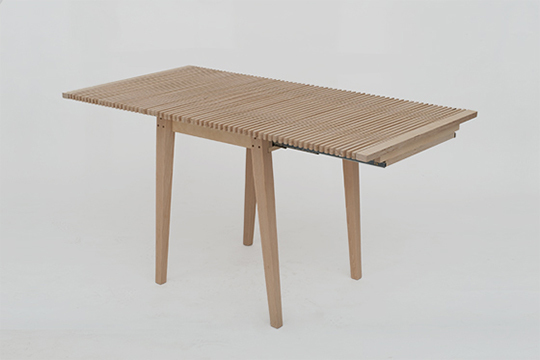 The narrative “to sit down at a table” (with an unknown) describes a social situation with the help of a daily object. It shows the intersection between the result of a complex individual judgment at first sight and the possible later formed relation. To link these aspects Inherent Reason is a hybrid object combining a physical table with a multilayered digital service. 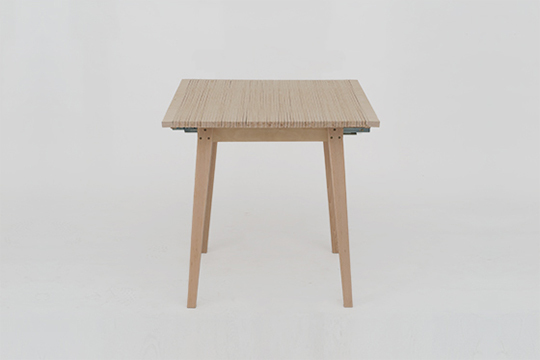 The table is capable to vary its length according to the predicted relation of the users, based on their social media appearance. While the user’s phone is placed on the table, an NFC connection leads to the landing page, where he logs in with Facebook connect. The service is fetching photos from the user’s Facebook account via graph API. Using IBM Watson’s visual insight, the service is able to identify the content of photos and uses this to generate a profile. Both resulting personality profiles of the current users are getting matched against each other. 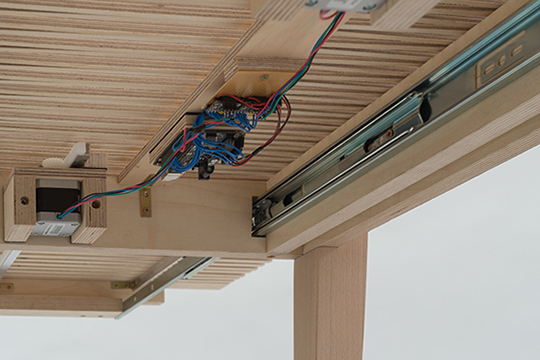 After the score is mapped into a distance, the desk varies its length with a gear system driven by stepper motors. Through the transformation the object dictates the interpersonal closeness and plays an active role in the interaction. In collaboration with Paul Seidler.